Continuing on my health kick (post holiday cleanse) I'm trying to incorporate more vegetables into my daily diet. It seems so easy to get my daily allotment of fruit (berries in oatmeal for breakfast, apple for a snack) but vegetables seem more difficult to work in. Jacobs and I love hummus and lucky for us, it's super healthy. 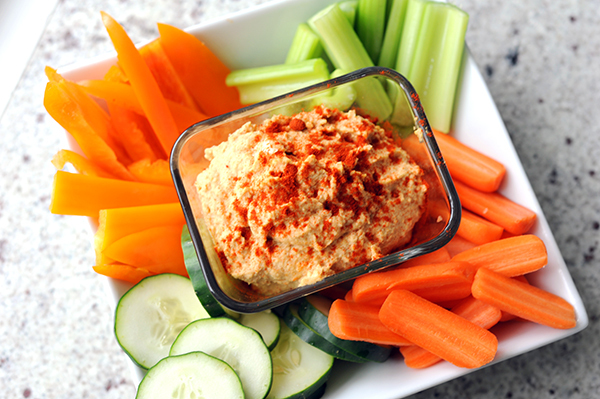 The primary ingredient in hummus is chickpeas, which are more popularly known as garbanzo beans. Chickpeas are high-protein legumes that do not contain any cholesterol or saturated fat. They are rich in protein and fiber and are effective in preventing the build up of cholesterol. Add in tahini (high in protein), olive oil (high monounsaturated fat), lemon juice and garlic (filled with antioxidants) and you've got a really satisfying dip that tastes incredible. 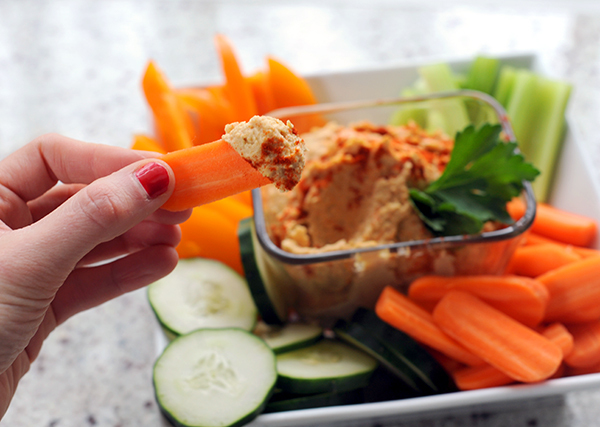 Serve with veggies and you're well on your way to achieving that 5 servings of veggies a-day goal. This is a really basic traditional hummus recipe. You can add in sundried tomatoes, caramelized onions or roasted garlic to change it up. 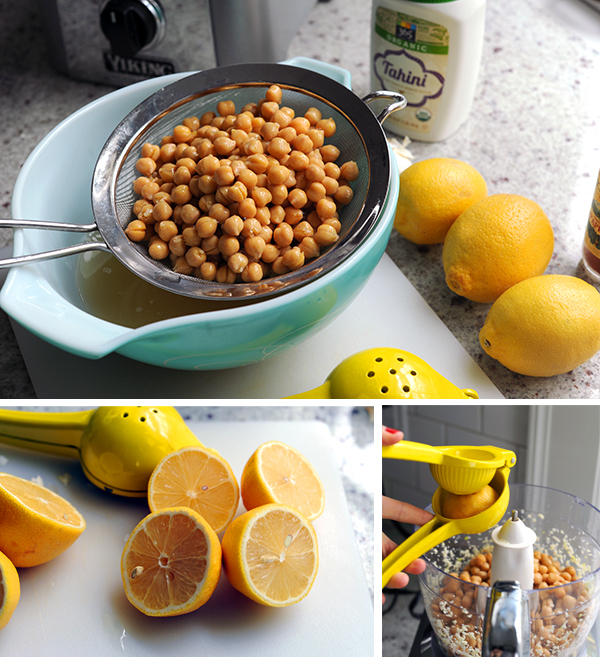 To get started, drain canned chickpeas and reserve the liquid. Pulse garlic, chickpeas, tahini and lemon juice in a food processor. Add in some of the chickpea liquid, olive oil and spices (smoked paprika and cayenne pepper) and pulse until coarsely pureed. Turn on the food processor fitted with the steel blade and drop the garlic down the feed tube; process until it's minced. Add the chickpeas, tahini, garlic and lemon juice to the food processor and pulse until combined. Add the the chickpea liquid (or water) and then olive oil through the feed tube with processor is on low speed until the hummus is coarsely pureed. Add in smoked paprika, cayenne pepper and salt to taste. Garnish with smoked paprika and parsley. Serve chilled or at room temperature. I really like to keep it in the fridge to snack on throughout the week. 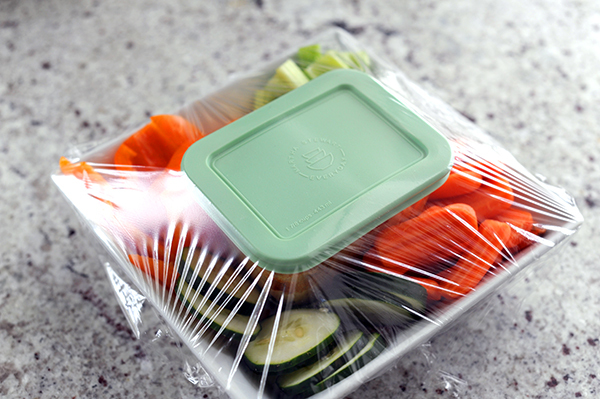 The trick is to put it in a container with the cut vegetables so it's easy to get out and eat. If I leave the veggies whole in the fridge, I'll never get them out and slice them up every time I want a snack. The easier you make it on yourself the more likely you are to eat it!